The 2018 New York Youth Go Open was hosted on November 17 at the New York Institute of Go in Little Neck, NY. The Institute’s first youth AGA-rated face to face tournament with both trophies and cash prizes attracted 45 young players from the minimum age of 4 to 10th graders. Eleven-year-old Sophie Lin 2d won the top division with a four-game winning streak. “We will continue working harder to hold more tournaments, and encourage and provide more opportunity to young players in New York!” said Institute president Stephanie Yin 1p. 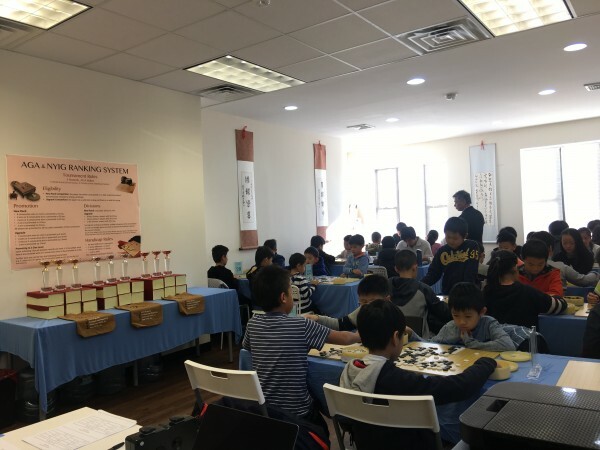 Every year, the New York Go Association and New York Institute of Go holds anywhere from 5-10 tournaments, with at least five of them youth competitions. Stephanie Yin has now taught nearly 400 youth players in New York, steadily growing the community of young go players. Click here for more on the Institute, including local tournaments, the Institute’s go club, and their YouTube channel.